LINDSAY PARK stud manager Andrew Perryman with mares and foals. pic Tait Schmaal. LINDSAY Park’s new owner plans to return it to its glory days, nearly 50 years after the late Colin Hayes developed Lindsay Park into a world-class horse racing and breeding operation. Wealthy Hong Kong businessman Pan Sutong has renamed the famous Barossa Valley property Goldin Farms and plans to turn it into an equine field of dreams, breeding champion racehorses. Goldin Farms will be developed as a significant horse breeding operation, standing stallions and running a band of 50 to 100 broodmares owned by Mr Pan as he restores the property. Mr Pan’s aims include redeveloping the famous horse breeding property to realise the intrinsic value it holds in the region. It will involve selecting a significant Australian architect to oversee extensive renovations and improvements to the homestead and the development of substantial buildings befitting a major horse stud. 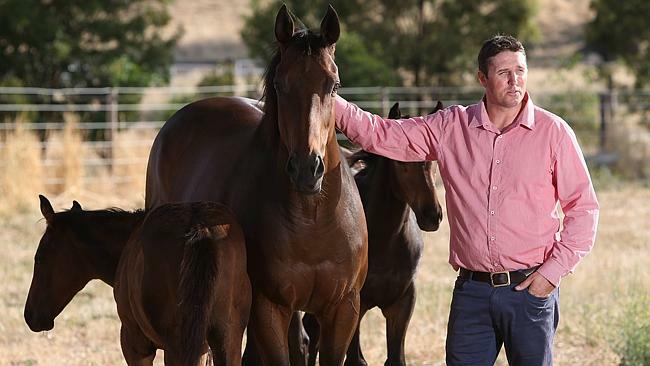 New stud manager Andrew Perryman said the aims include helping to strengthen the South Australian racing and breeding industry by working closely with neighbours such as Colin Hayes’ grandson Sam Hayes, next door at Cornerstone stud. Mr Pan’s ownership of the 500ha property completes the sale of the former Lindsay Park following the move of David Hayes to a new training property at Euroa in Victoria. It has included the sale of the 93ha racing complex to McEvoy Mitchell Racing’s Kidalton Park in 2011 and an adjoining 160ha to the Cornerstone Stud of Sam Hayes and Darren Thomas. Mr Pan is renowned for his midas touch across electronics to property development, finance, wine production and horse racing. He made his fortune in consumer electronic equipment, founding the Matsunichi Group in Hong Kong in 1993, producing electronic components and products for world famous brands as well as its own brand tablets, USB modems, pocket Wi-Fis and mobile phones for sale in Asia and the United States. His company, the Goldin Group has diversified rapidly to include Goldin Properties Holdings and Goldin Financial Holdings, both listed on the Hong Kong Stock Exchange, and employing more than 12,000 people around the world. The wine loving businessman owns three substantial chateaux in France and the renowned SLOAN Estate in the United States, while he is also a significant figure in the international polo world. He bought his first racehorses in 2011 with immediate success as his horse Akeed Mofeed won the Hong Kong Derby and the Hong Kong Cup last year, while Gold-Fun won the Hong Kong Classic Mile and three other races in 2013. Akeed Mofeed is expected to be the foundation stallion at Goldin Farms, this Spring, or if his racing form holds, in 2015. Mr Perryman, formerly stud manager at Sheikh Mohammed bin Rashid Al Maktoum’s Woodlands stud in New South Wales, started work as Goldin Farms stud manager this month. Mr Perryman said the business will employ about 20 people as it builds up to become a major breeding operation once again. He is optimistic about the part Goldin Farms can play in helping to rebuild the South Australian horse breeding industry. It has already bought a dozen broodmares in Australia and owns more mares overseas including some in the United States. Mr Pan also expects to have horses racing in Australia and Europe this year as he builds his international thoroughbred interests. “We are deeply respectful of the historical sensitivities of the property and its place in the Barossa Valley’s heritage and we look forward to building on the Hayes family’s reputation,” Mr Perryman said. Goldin Group Vice President Sean Fang said the cost of the redevelopment will depend on the appointment of an architect and the subsequent proposal. Mr Fang said Mr Pan had invested in South Australia because it has always been seen as a leading horse breeding and training state, while Lindsay Park has had such a strong heritage in both breeding and training racehorses. “We believe that South Australia is an ideal equine environment for breeding and training racehorses,” Mr Fang said. Goldin Farms will also explore the possibility of breeding polo ponies for the Goldin Group’s Tianjin Goldin Metropolitan Polo Club in China, which has been operating for three years and has more than 200 polo ponies. But Mr Fang said the polo pony breeding plan is still very preliminary and its priority is breeding racehorses. Goldin Farms will hire local people as far as possible and has already appointed long-time Lindsay Park employee Winfried Meyer as the building project manager.